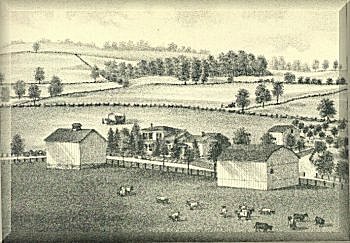 Erin was formed by an act of the legislature of New York, passed March 29, 1822, and approved by Governor Dewitt Clinton, taken from the town of Chemung. It is situated in the highlands, in the north eastern portion of the county, and its surface is broken and uneven with several valleys through which flows Newton, Baldwin, Jackson and Wynkoop creeks. The soil is quite well adapted to grazing, and some very fine farms are found in the township. It is bounded on the north by Cayuta, in Schuyler county, on the east by Van Etten, on the south by Baldwin, and on the west by Horse Heads and Veteran. The Utica, Ithaca and Elmira railroad passes through the center of the town from west to east. At an election held pursuant to law, on the third Tuesday of May, 1822, at the house of John Banfield, the officers elected were, Alexander McKey, supervisor, Arden Austin, town clerk; Daniel Vaughan, Thomas Baker, Ebenezer Brown, assessors; John A. McKey, Jared Patchen, David Swartwood, commissioners of highways; John Tuthill, Robert McDowell, William D. Steward, commissioners of common schools; Alexander McKey, Arden Austin, Francis Banfield, inspectors of common schools; John Tuthill, Robert McDowell, overseers of the poor; Varnum McDowell, constable and collector; Thomas Baker, John Banfield, fence viewers; John Banfield, pound keeper. Joseph Frost, Daniel Vaughan, Henry Decker, Benjamin Smith, William Smith, Elijah Shoemaker, Isaac Shoemaker, Jeremiah Barnes, John Cooper, John Burrows, W. D. Stewart. Robert Stewart, James McMillan, James McMillan, Jr., George R. McMillan, Elihu Everett. --John Mitchell kept the first tavern. --Arden Austin was the first surveyor. --The first school house was built in 1818. --Basil Sperry built the first house, in 1815. --Basil Sperry harvested the first crop, in 1816. --Mrs. Basil Sperry was the first who died in Erin. --Joseph Rodburn built the first grist mill, in 1855. --The first teacher in Erin was Robert Stewart, 1818. --Thomas Baker built the first framed house, in 1825. --Dr. James McMillan was the first resident physican. --James H. Rodburn established the first store, in 1867. --The first church erected was by the Presbyterians, in 1836. --James and Joseph McMillan built the first saw mill, in 1824. --Green M. Tuthill was county clerk in 1847-9, deputy sheriff 1838-40. --Erin was bonded for $30,000 to help construct the U. I. & E., R. R. in 1874. --In 1844, Hon. S. Hazen, of Erin, represented Chemung county in the assembly. --Isaac Boyer, John Hollenback, David Caywood, John Thomas were soldiers in the revolutionary war. --Robert Stewart done distinguished service during the war of the rebellion, and was elected county clerk in 1868. --Baptist Church of Erin was organized in 1864, Rev. Mr. Whitney was the first minister, church erected in 1871. --John A. McKey was superintendent of the poor, justice of the sessions two terms, county coroner, supervisor, justice of the peace. --Jason P. Woolever represented the township several time as supervisor, commissioner of loan, in 1854, justice of sessions and justice of peace. --The M. E. Church was organized in 1827. Rev. James Taylor was the first local preacher. The original members were Jeremiah Barnes and wife, C. C. Humphreys and wife, Joshua Baker and wife, Cornelius Becker and wife, James Baker and wife.